The hypertext transfer protocol (HTTP) has been widely used as a communication protocol for Internet access. However, for Internet of things (IoT) communication, which is expected to grow in the future, HTTP requires a large overhead and cannot provide efficiency. In order to solve this problem, lightweight communication protocols for IoT have been discussed. In this paper, we clarify some problems of HTTP for IoT and propose MQ telemetry transport (MQTT), which is a promising candidate for the IoT protocol, after conducting a performance comparison with HTTP. D. Miorandi, S. Sicari, F. D. Pellegrini, and I. Chlamtac, “Internet of things: vision, applications and research challenges,” Ad Hoc Networks, vol. 10, no. 7, pp. 1497-1516, September 2012. A. Al-Fuqaha, M. Guizani, M. Mohammadi, M. Aledhari, and M. Ayyash, “Internet of things: a survey on enabling technologies, protocols, and applications,” IEEE Communications Surveys & Tutorials, vol. 17, no. 4, pp. 2347-2376, June 2015. R. Fielding and J. Reschke, “Hypertext transfer protocol (HTTP/1.1),” IETF, RFC 7230-7235, 2014. ITU-T, “Framework of data aware networking for future networks,” ITU-T Recommendation, Y.3033, January 2014. G. Xylomenos, C. Ververdis, V. A. Siris, N. Fotiou, C. Tsilopoulos, X. Vasilakos, K. Katsaros, and G. C Polyzos, “A survey of information-centric networking research,” IEEE Communications Surveys & Tutorials, vol. 16, no. 2, pp. 1024-1049, 2014. M. Amadeo, C. Campolo, J. Quevedo, D. Corujo, A. Molinaro, A. Iera, R. Aguiar, and A. V. Vasilakos, “Information-centric networking for the internet of things: challenges and opportunities,” IEEE Network, vol. 30, no. 2, pp. 92-100, March 2016. M. M. S. Soniya and K. Kumar, “A survey on named data networking,” Proc. Electronics and Communication Systems 2nd International Conf., IEEE Press, June 2015, pp. 1520-1522. O. Waltari and J. Kangasharju, “Content-centric networking in the internet of things,” 2016 13th IEEE Annual CCNC, pp. 73-78, March 2016. T. Yokotani, “Tutorial: M2M/IoT technical overview and its standardization,” Proc. The 18th Asia-Pacific Network Operation and Management Symposium, October 2016. 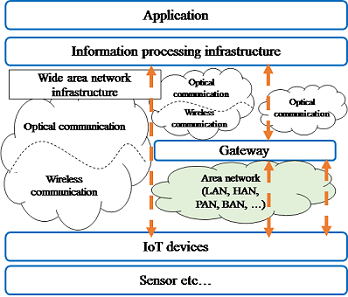 T. Kinosita and T. Hirata, “Technical standardization of IoT / M2M, industry alliance trend,” Proc. IEICE general conf. March 2017. T. Sato and K. Yu, “Introduction of standards activities for information-centric networking,” IEICE general conference BT-2-3, 2017. M. Särelä, T. Rinta-aho, and S. Tarkoma, “RTFM: publish/subscribe internetworking architecture,” IST Mobile Summit, June 2008. Z. Babovic, J. Protic, and V. Milutinovic, “Web performance evaluation for internet of things applications,” IEEE Access, vol. 4, pp. 6974-6992. October 2016. D. Thangavel, X. ma, A. Valera, H. Tan, and C. Tan, “Performance evaluation of MQTT and CoAP via a common middleware,” 2014 IEEE Ninth International Conf. on ISSNIP, IEEE Press, April 2014, pp. 1-6. T. Yokotani and Y. Sasaki, “Comparison with HTTP and MQTT on required network resources for IoT,” Proc. Control, Electronics, Renewable Energy and Communications, IEEE Press, September 2016, pp. 1-6. R. Nakamura and H. Ohsaki, “Performance evaluation and improvement of large-scale content-centric networking,” Proc. Information Networking (ICOIN), IEEE Press, April 2017, pp. 103-108. J. Chen, S. Li, H. Yu, Y. Zhang, D. Raychaudhuri, R. Ravindran, H. Gao, L. Dong, G. Wang, and H. Liu, “Exploiting ICN for realizing service-oriented communication in IoT,” IEEE Communications Magazine, vol. 54, no. 12, pp. 24-30, December 2016.
antitharanukul, K. Osathanunkul, K. Hantrakul, P. Pramokchon, and P. Khoenkaw, “MQTT-topic naming criteria of open data for smart cities,” Proc. Computer Science and Engineering Conf. (ICSEC), IEEE Press, December 2016, pp. 1-6. N. Tantitharanukul, K. Osathanunkul, K. Hantrakul, P. Pramokchon, and P. Khoenkaw, “MQTT-topics management system for sharing of open data,” Proc. Digital Arts, Media and Technology (ICDAMT), IEEE Press, March 2017, pp. 62-65. J. López, M. Arifuzzaman, L. Zhu, Z. Wen, and S. Takuro, “Seamless mobility in data aware networking,” Proc. 2015 ITU Kaleidoscope: Trust in the Information Society, IEEE Press, December 2015, pp. 1-7. Y. Sasaki and T. Yokotani, “Performance Evaluation of MQTT as a Communication Protocol for IoT and Prototyping”, AITI, vol. 4, no. 1, pp. 21-29, Jan. 2019.